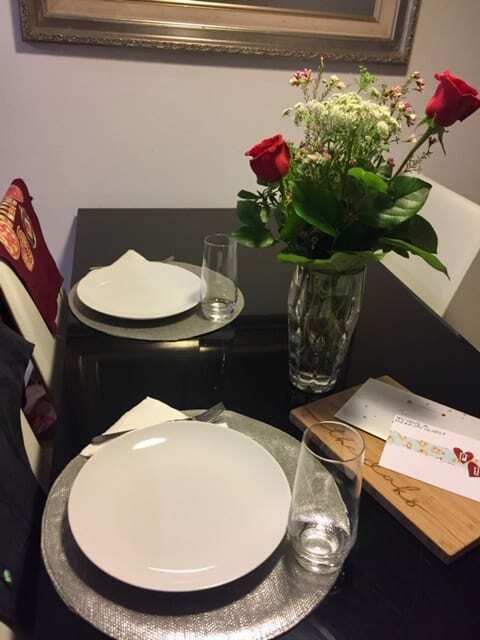 We have both made it our tradition to spend Valentine’s Day at home and take this as our opportunity to set the table beautifully while making a special meal for our hubbys. 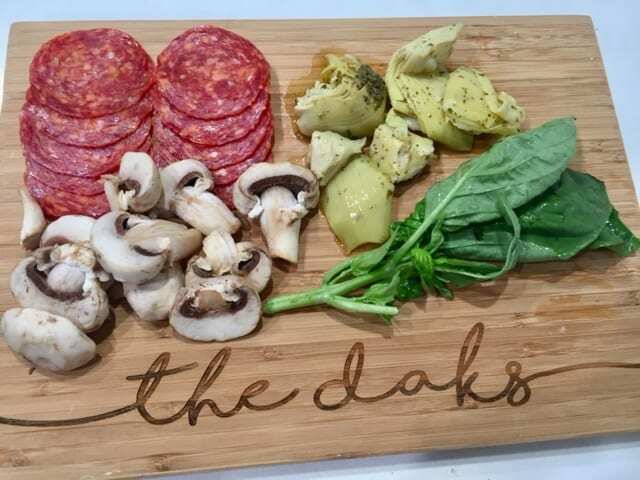 We have had fun in the past coming up with a menu consisting of food items that we do not regularly serve and fun themes that will keep things exciting. 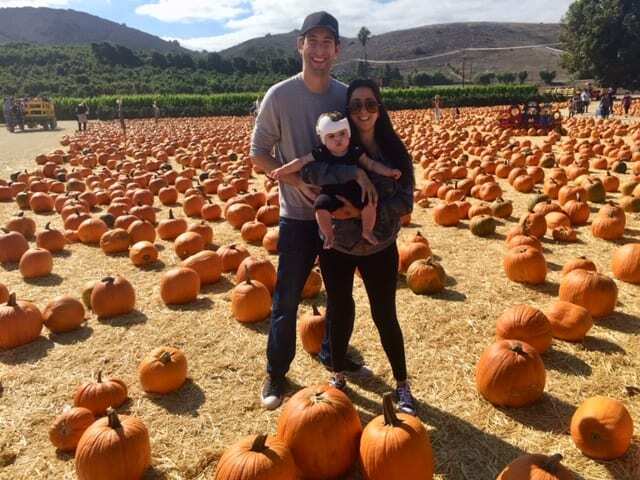 As a mom, Lauren has continued this tradition in a more kid-friendly fashion, and this year will once again plan something special for her husband and all three of her girls. 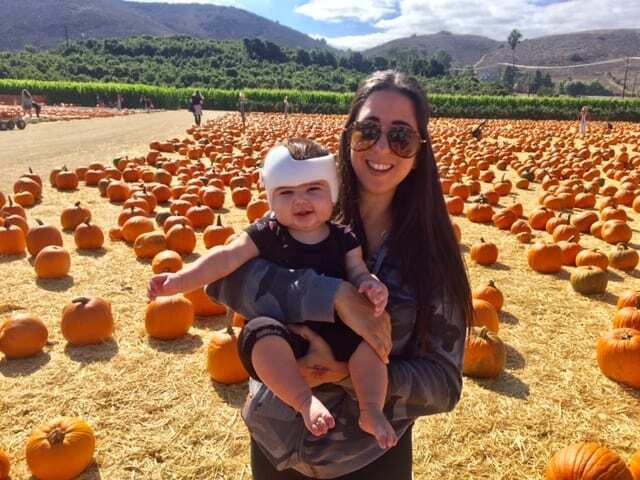 As a new mom, Tami is excited to incorporate her daughter into her plan as well. 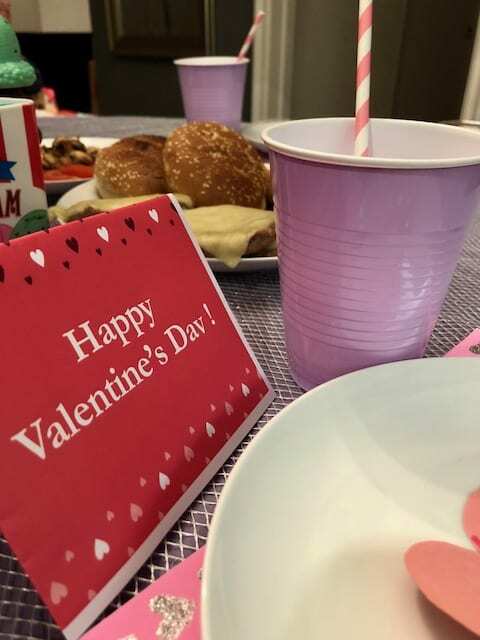 Here’s a look back on how we each celebrated Valentine’s Day last year. 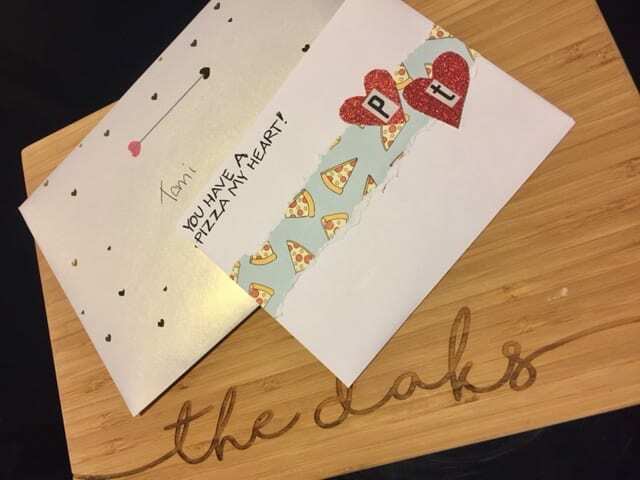 T Side: My relationship with Phil started out with a cheesy pick up line about pizza, I am sure that throughout our over four years together we have shared numerous slices, and it just so happened that one of the few things that actually tasted good to me all throughout my pregnancy is pizza as well! Good enough reason for a theme? I think so! 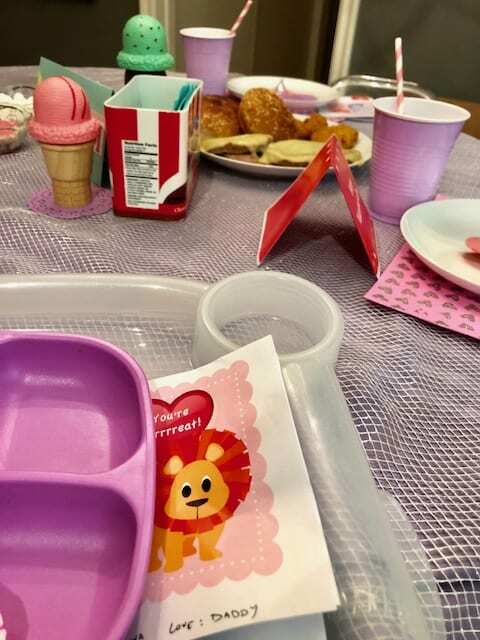 Last year’s Valentine’s Day was weeks away from my due date, and I had a few things on my mind … I wanted to keep things simple and eat whatever sounded good! So, I decided to throw an impromptu pizza party for me and my love. 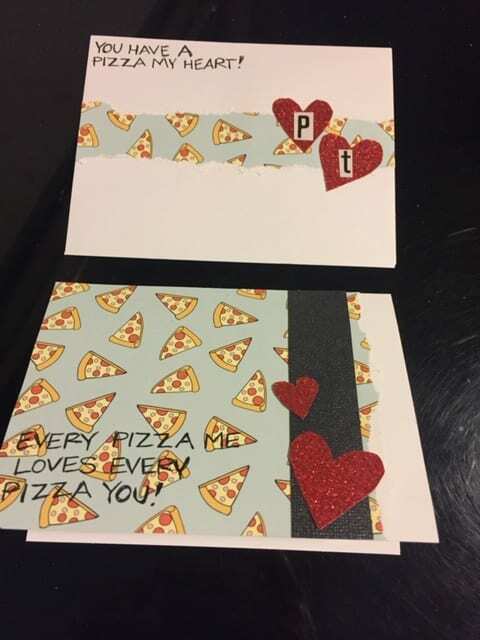 They say that the way to a man’s heart is through his stomach, and my man also happens to be a fan of cheesy sayings, so I created a card that I knew he would love. Here’s one more lame (but fun) line I included … You still take my breath away … even though I get winded just walking up the stairs. Not bad for a little pregnancy humor, huh? 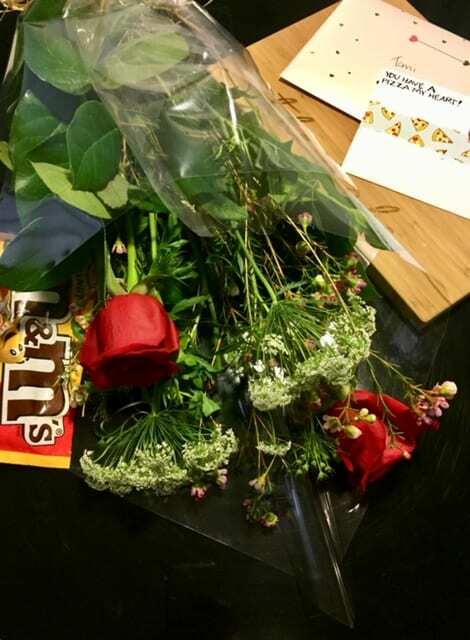 He knows that the way to my heart is through fresh flowers and peanut M&M’s, so he surprised me with what I love too! I set our table with just a few simple touches … No need to do extra dishes or spend lots of time cleaning up. 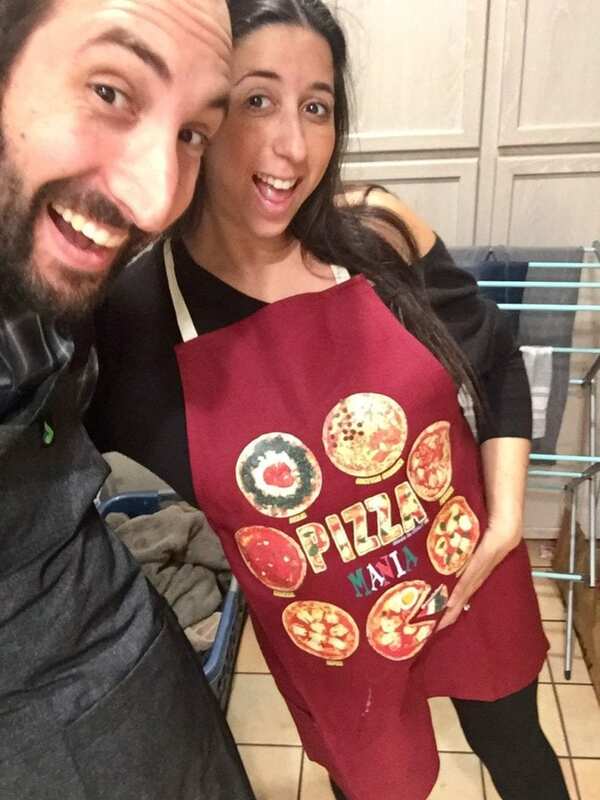 This apron (a family member brought me back one year from Italy) could not have been more perfect for our theme. 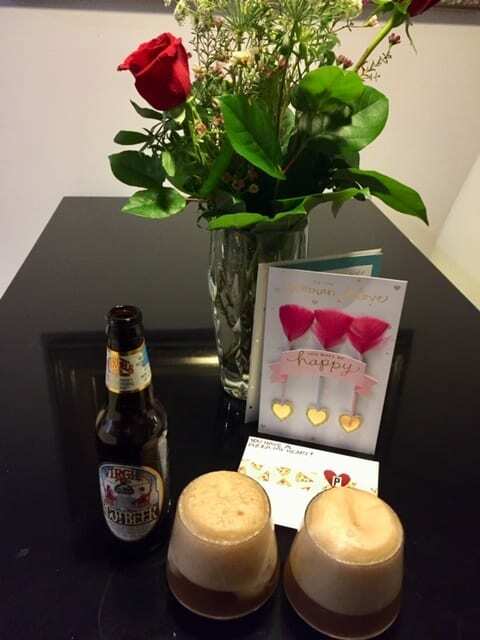 I loved getting the chance to cook together with my husband last Valentine’s Day! We made a simple yet delicious salad that consisted of arugula, heirloom tomato, feta cheese, and shallots. I bought our favorite wheat pizza dough from Trader Joe’s and we made our own homemade pizzas. 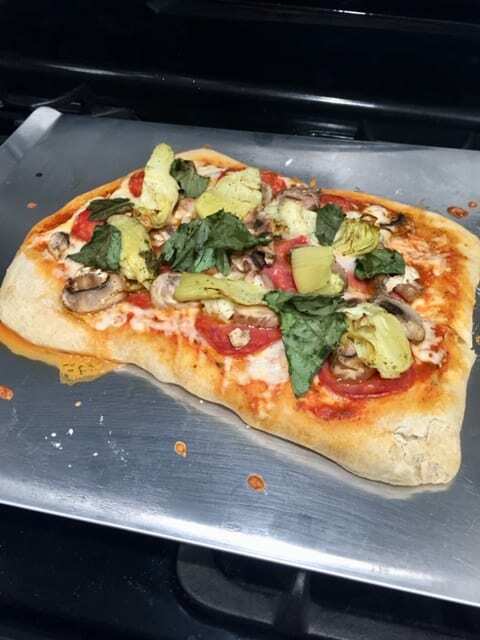 Toppings included: marinated artichokes, pepperoni, mushrooms, mozzarella cheese, and fresh basil. 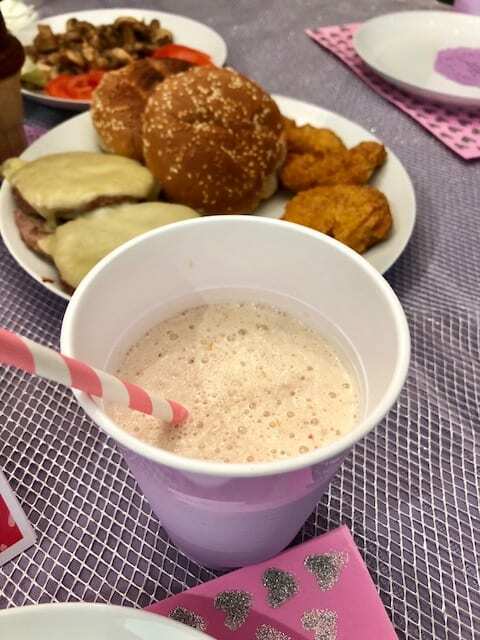 Who doesn’t love root beer floats for dessert? 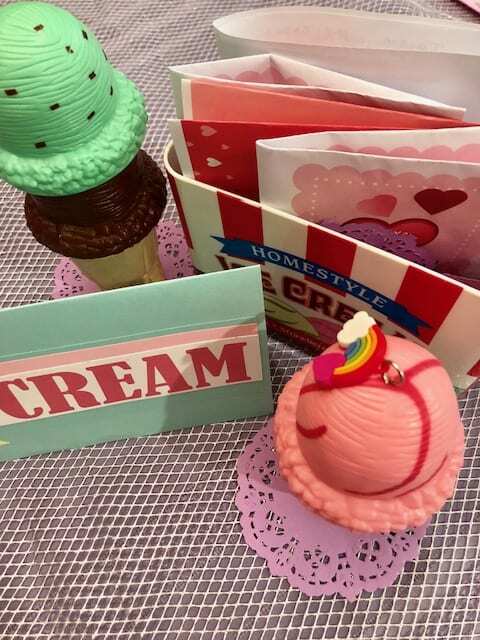 L Side: With three little girls at home, I decided to do something last year that they would get excited about and molded my whole concept around the theme of an “ice cream parlor”. 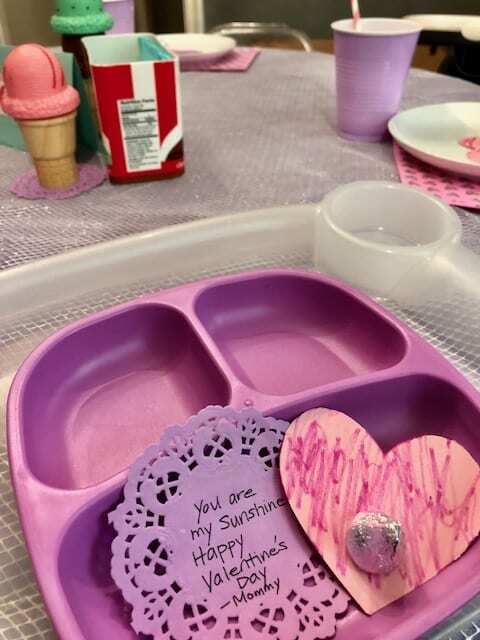 I used some of their cute Melissa and Doug parlor toys as decor and set the table with adorable place mats and personalized valentine’s for each of my favorite people. 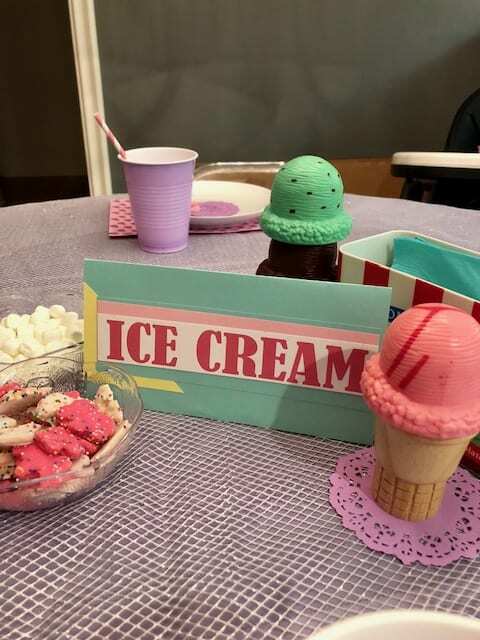 I put out fun toppings and cute little signs to decorate the table with and to give the whole look a sort of retro / pastel / “Saved by the Bell” type parlor feel. 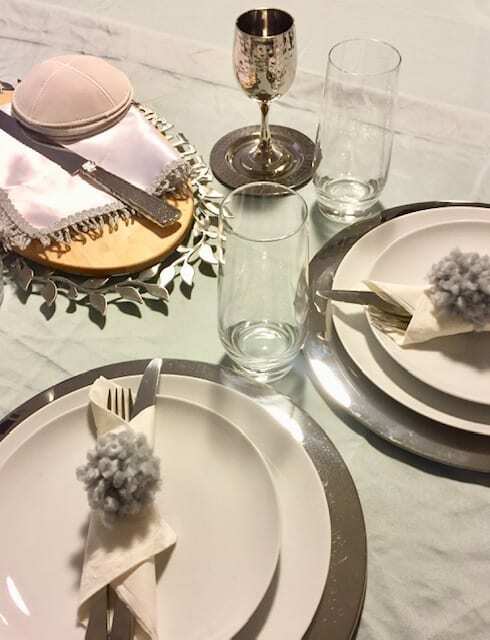 I made a conscious effort to make my dining table look different than our standard every day meal and covered the table in a silver mesh fabric I had lying around topped with festive foam place mats with glittery hearts. 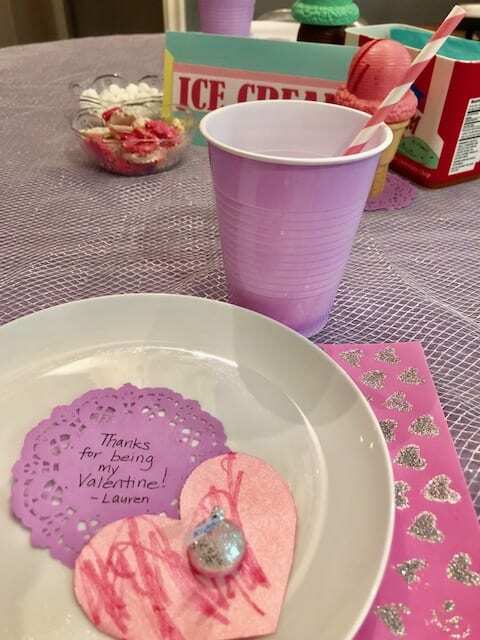 We used the center box as a holder for all of our fun valentine’s. Ava made some, and Scott even got creative with his computer at work. We keep it simple in our house. 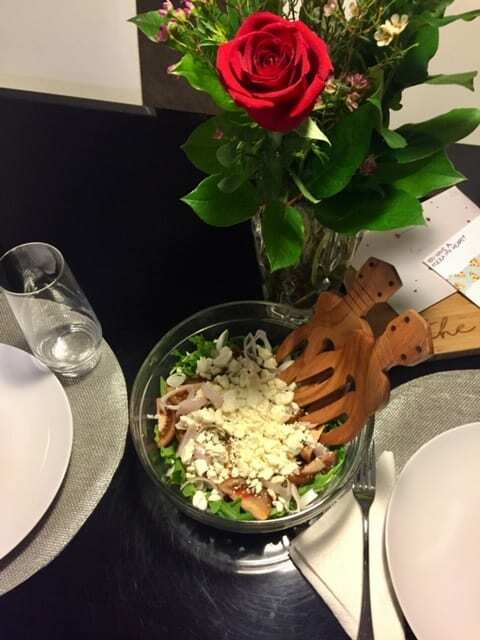 No fancy dinners out or expensive gifts, but we add special touches and create an experience at home that is different than our day to day. 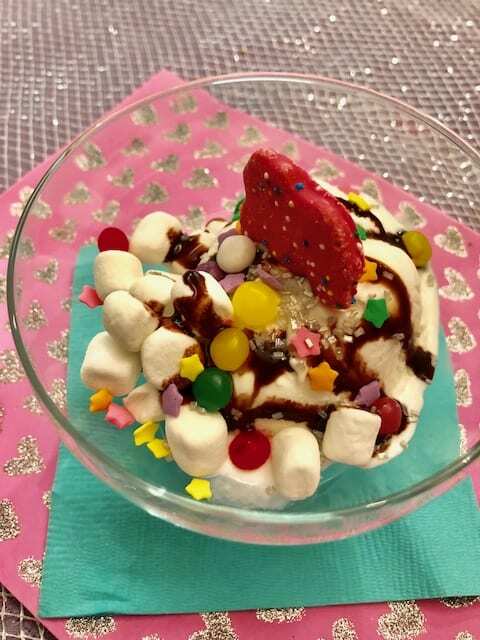 … and ice cream sundaes with every type of toppings! The kids had so much fun decorating their own! 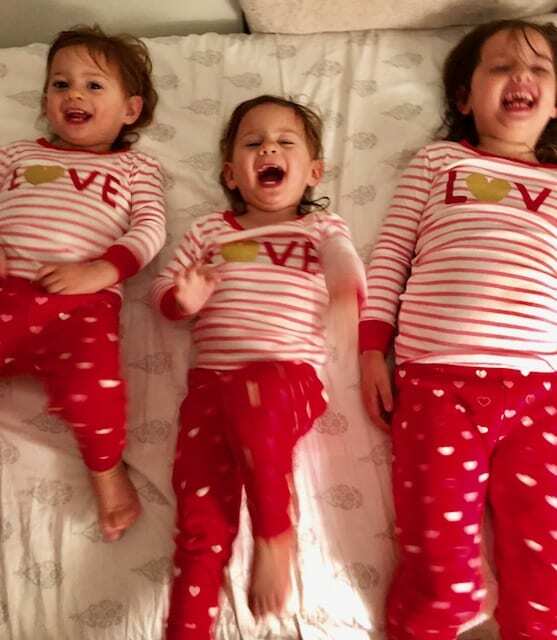 Of course we had to end the night in matching PJ’s … Cuz why not!? We each plan to have an equally special Valentine’s Day this year! 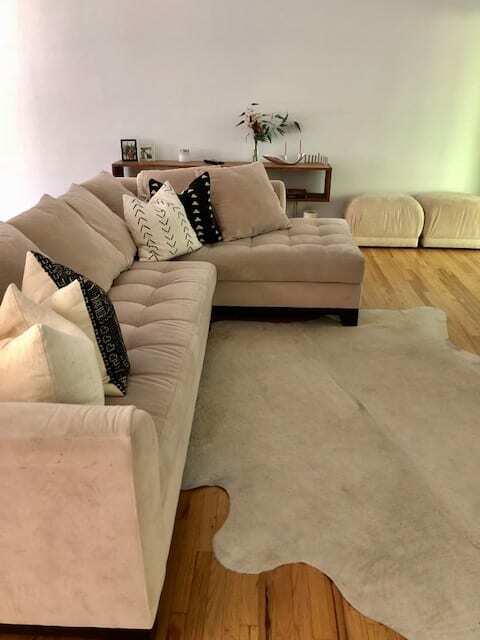 Lauren, Scott, and the girls are continuing to keep things simple and keep their at-home tradition alive while Tami and Phil will enjoy spending this day with their daughter Joie in on the plans. Whatever you plan to do with your Valentine this year, remember that what is really important is that you make the day special and show them how much you really love them! Happy Valentine’s Day from Side by Side Design! This edition of Hosting at Home is one I know you will all be able to relate to right now as you are all most likely hosting and attending holiday parties of all kinds. Last year, I had the opportunity to host our annual family Chanukkah party (for one side of our extremely large family) in my home. 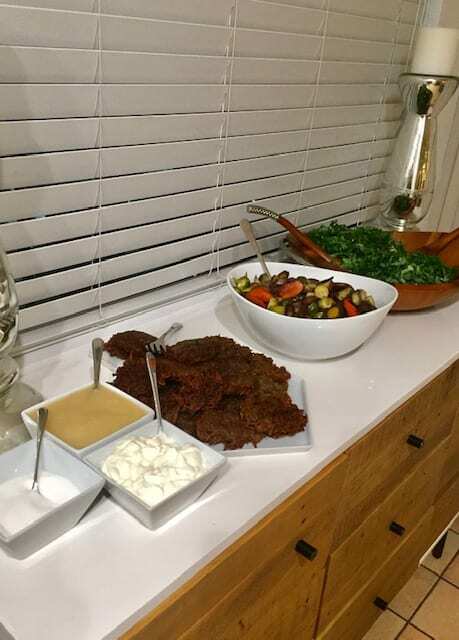 What I love most about inviting guests over is getting the chance to try out new recipes and making my table and food presentation look “just so”! 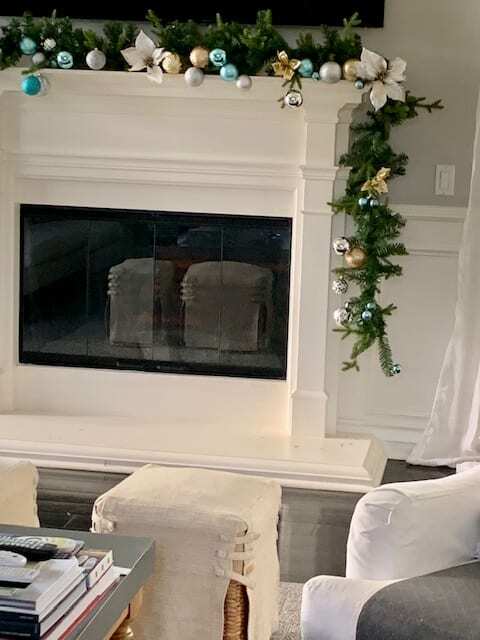 I usually get inspired by a theme, color scheme, or the menu itself and then the cooking and decorating take on a life of their own, but sometimes it is my space itself or my current decorations (depending on the holiday) that inspire me. You may remember this gift wrap from last year’s T Side / L Side Holiday Wrapping post. 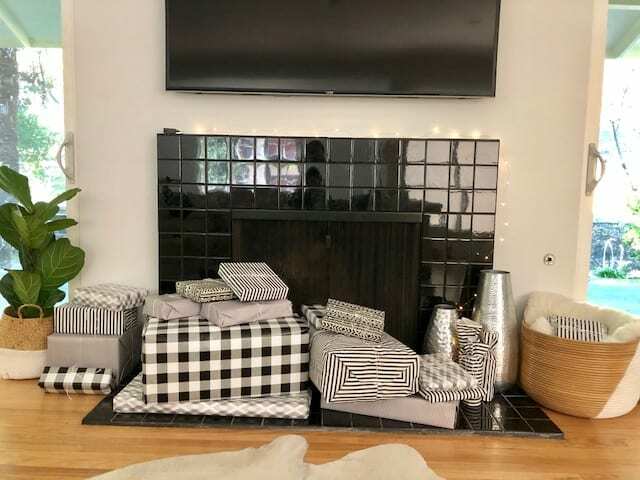 The one thing I love to do most during the holidays is to come up with a look for the gifts that I give, wrap them with care, and see them all together coordinated nicely in the end. I do have a bit of a thing for coordination! 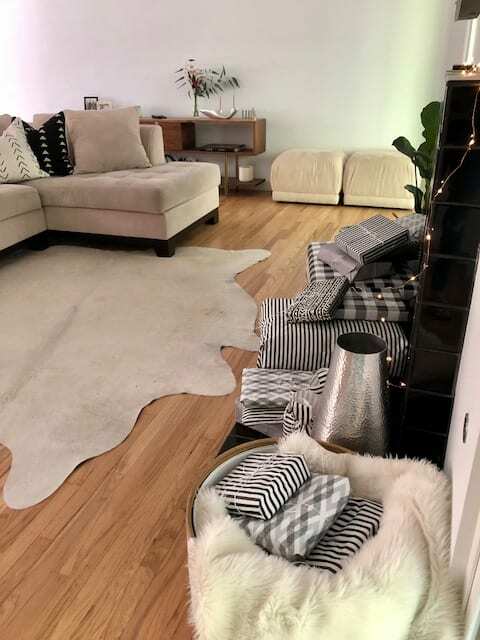 I don’t stop there … The rest of my decor needs to match as well, and if I have people over during that time I like to add touches of the look I have created into my plan for that set up too. Some may think this sounds stressful, but for me having it all go together means I only have to think about one way of doing things for all creative aspects of my life that month or during that time of year. 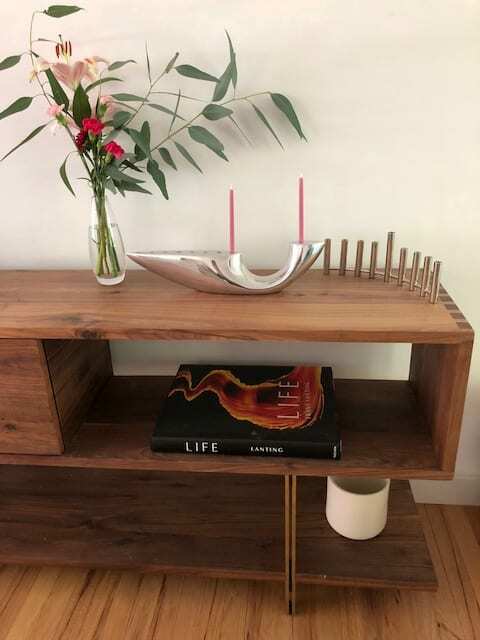 As it was Chanukkah and Shabbat, Phil and I were able to use many of our beloved gifts we were given for our wedding including our new tree shaped menorah and this gorgeous wood and silver leaf challah plate. 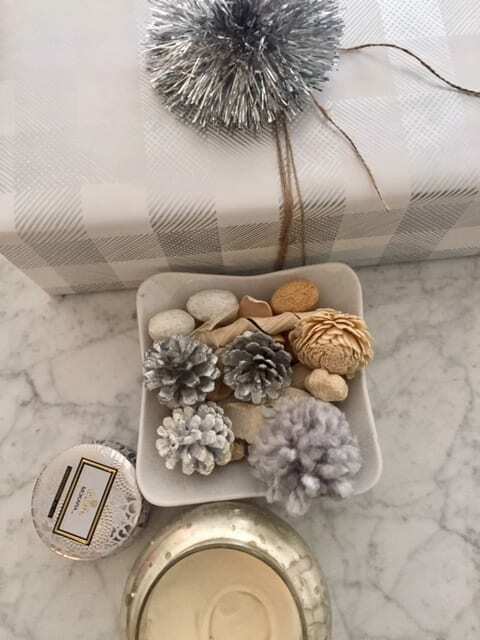 Silver chargers made our table look fancy, festive, and ready for the holidays. 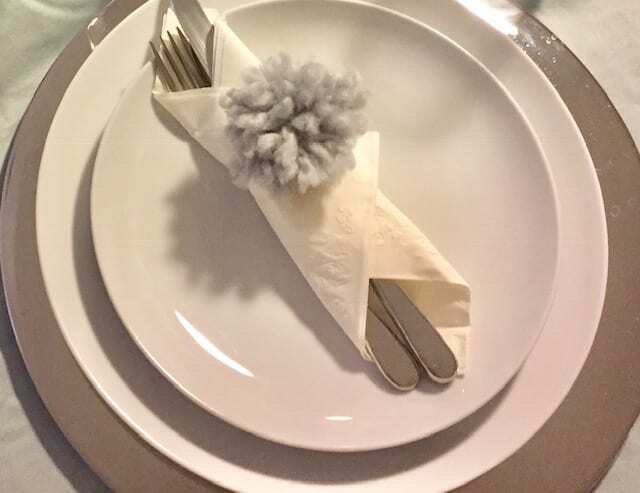 These handmade pom poms made an appearance in my decor, atop many of the gifts I handed out last holiday season, and made for really cute napkin rings too! Here’s a tip: It’s always fun to think of other ways to use your decor. As I mentioned, hosting is a great opportunity to try out new recipes. 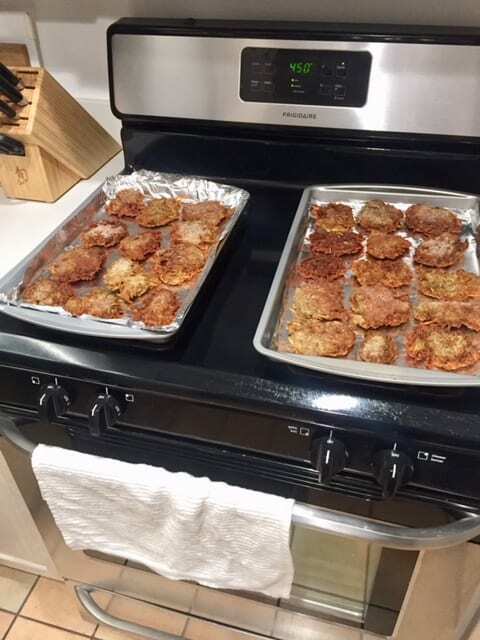 Last year, we were extremely ambitious and used my grandpa’s recipe to make delicious potato latkes. It wasn’t as hard as I thought it would be, but we did spend a lot of time peeling potatoes, and I wouldn’t try this at home unless you have a really good food processor (which luckily I do!). Our little space was packed full once we made the table big enough for all of our guests to sit, so I set our dinner up buffet style on my favorite West Elm cabinet. 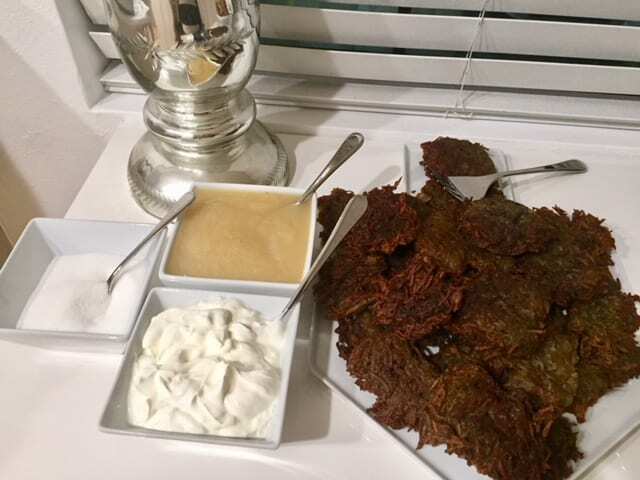 I had been looking for an excuse to use this dreidel tray and found it was the perfect place to put my homemade latkes accompanied by all our favorite toppings. One part of the story I have failed to mention so far is that I was also pregnant last year at this time. 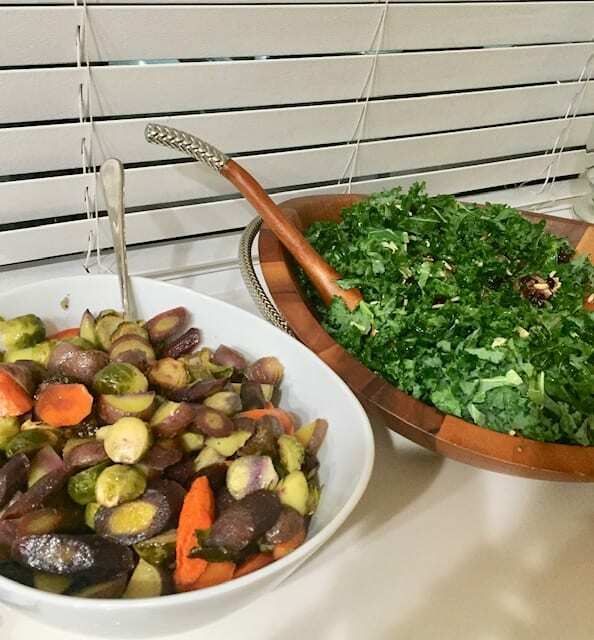 In an effort to take a little pressure off of myself, I asked all of our guests to contribute a dish to our dinner and each did so graciously … Kale salad, roasted veggies, traditional Moroccan fish, and more! If you are as particular as me, you can be specific with what you want your guests to bring and place them in your own serving dishes once they arrive. 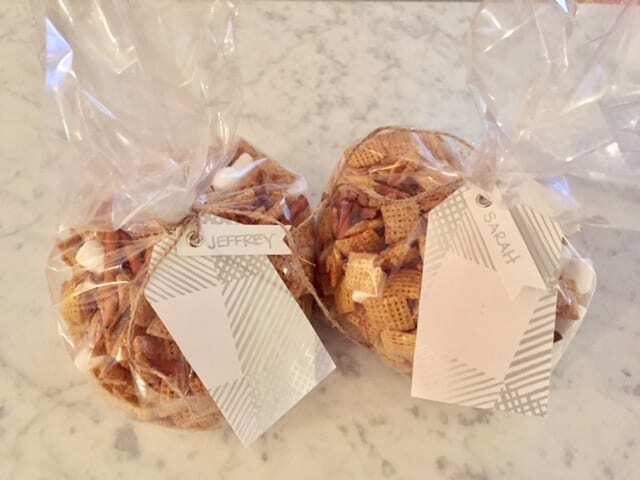 I did, however, get big time into baking last year in my pregnant state and sent each of my guests home with a special treat complete with tags that matched my decor. When hosting in your home, do what feels most natural to you while trying to push yourself a little each time to think outside the box. Until next time … Happy Holidays and Happy Hosting from Side by Side Design! 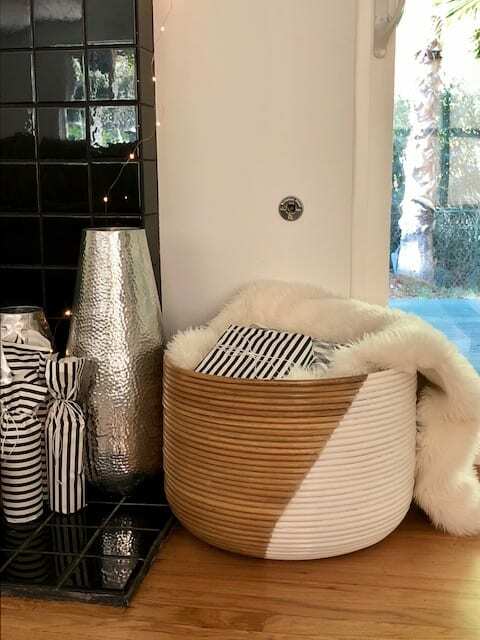 In last year’s post, T Side / L Side: Holiday Wrapping, we invited you into our homes and continued to show you our own personal design styles. We each have our own “Side” or way of doing things, which makes us unique (even though we are twins). 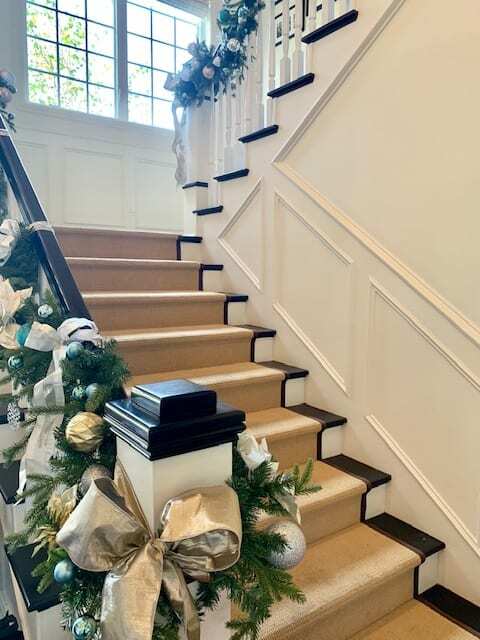 When we plan our gift wrap for the holidays and ways to decorate our spaces and make them festive, these distinct styles carry through. 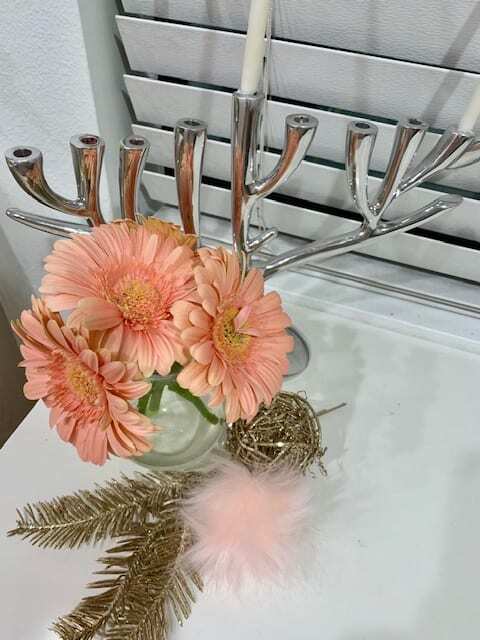 With Chanukkah having just started and Christmas just around the corner, we thought it would be fun to give you some last minute ideas for how to wrap and decorate for the holidays. 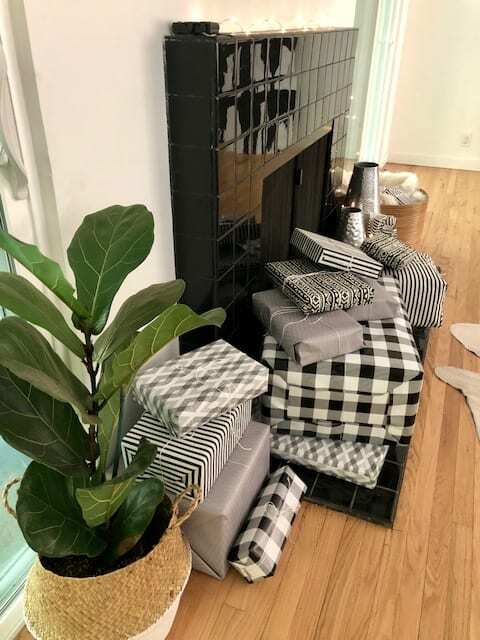 We especially always like to think outside the (gift) box when planning our gift wrap (and use colors, patterns, and textures that are unexpected and fun). Here is what we have come up with for our own Chanukkah wrapping this year. Feel free to use this as inspiration in planning your own holiday gift wrap as well. 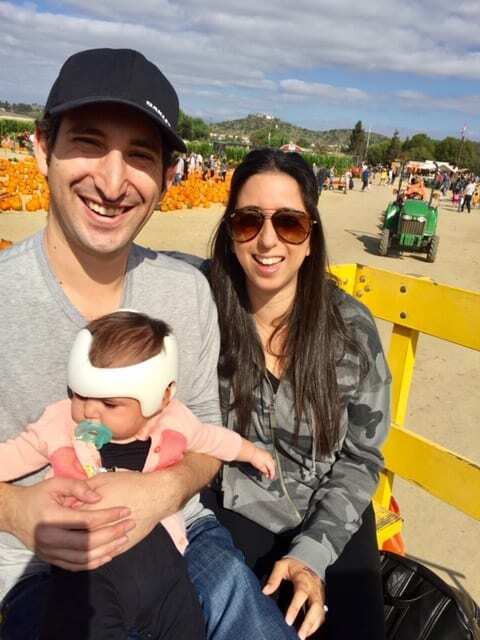 T Side: This year I am celebrating Chanukkah as a first time mom! 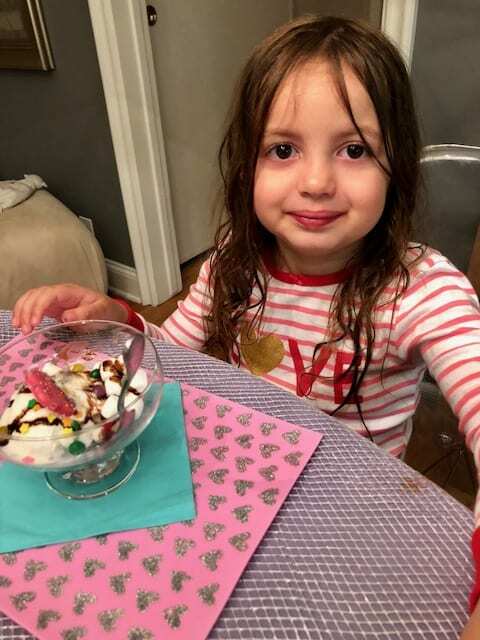 I know my little girl won’t remember these eight festive nights, but I intend to make them special anyway and take as many pictures as I can to show her as she gets older. In her honor (and just because … Why not? 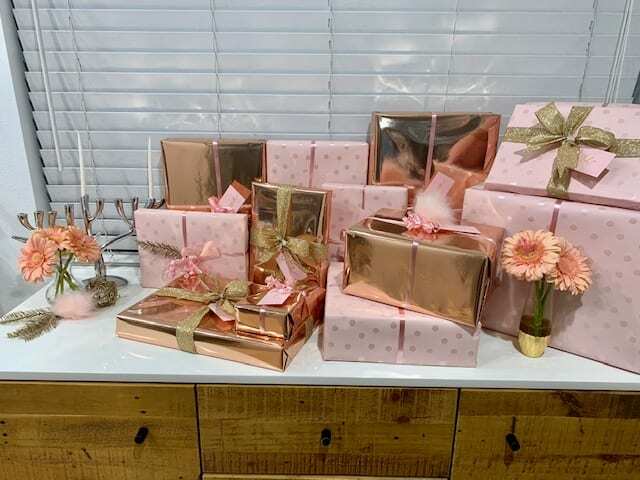 ), I went with pink as the color scheme for all of our decorations and gift wrap this year and threw in some pops of gold and rose gold to make it that much more fun! Like I said, this year is all about Joie! Phil and I planned out some gifts that we thought she could appreciate (Let’s be real, I also bought her a few cute things to wear which is really more for me!) 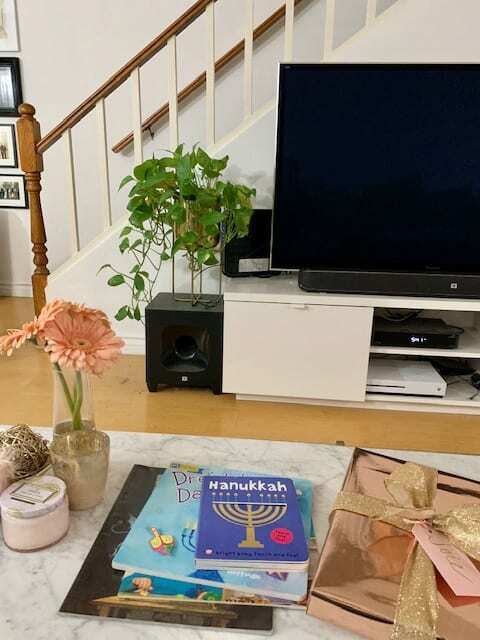 and set out Chanukkah books to read to her each night. Fresh flowers always look great when decorating, and I kinda think my gifts look great too! 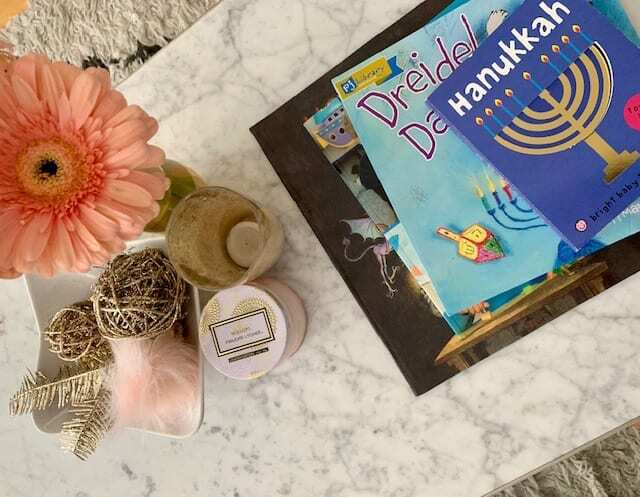 As we light the candles each night, we will teach our baby the traditions that have been passed down to us from our parents … Isn’t that what the holidays are really about? L Side: I have a first this year too! 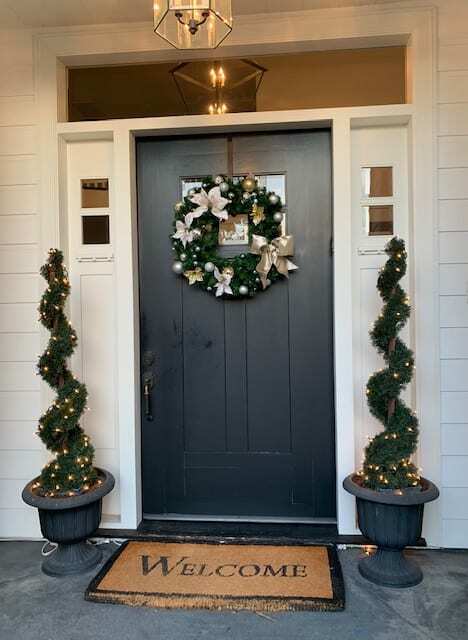 First year in my new home, and I couldn’t be more excited to have been able to decorate a new space this holiday season. 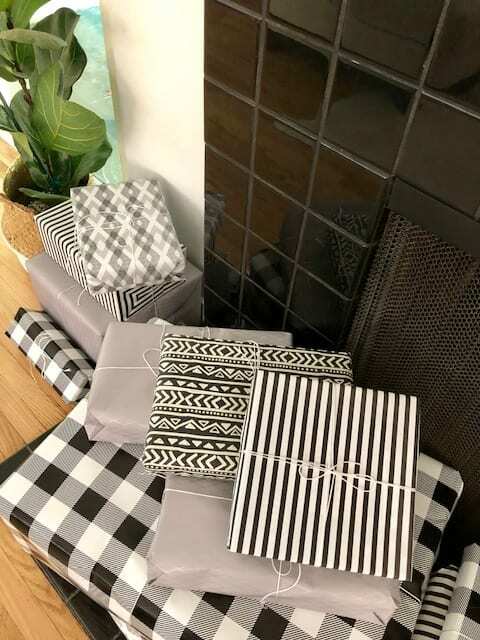 I wanted to fully embrace the style I am diligently working on bringing to life in my space (Modern Bohemian) and decided to go with a pretty simple black and white color scheme for my gift wrap to tie it all together. I used different patterns and textures like I did in my home to create interest and threw in just a few pops of pink to make my girls happy. This is the current state of my living room. It is by no means finished (which is why it has not been shown yet here on the blog). 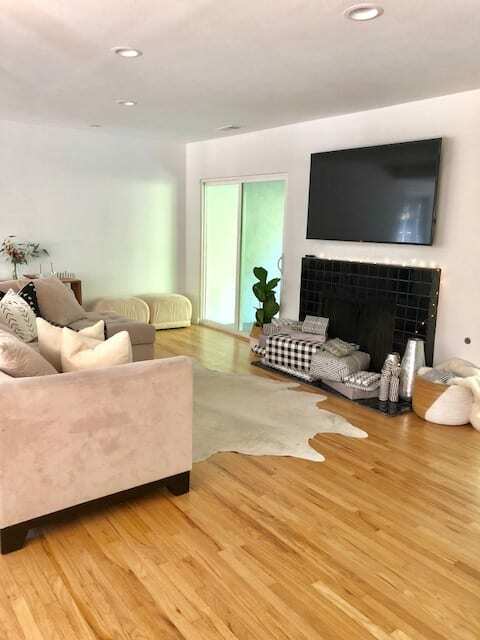 We plan to get a new sofa, a coffee table, reupholster those ottomans in the back corner, hang artwork … You get the idea, it’s not done! 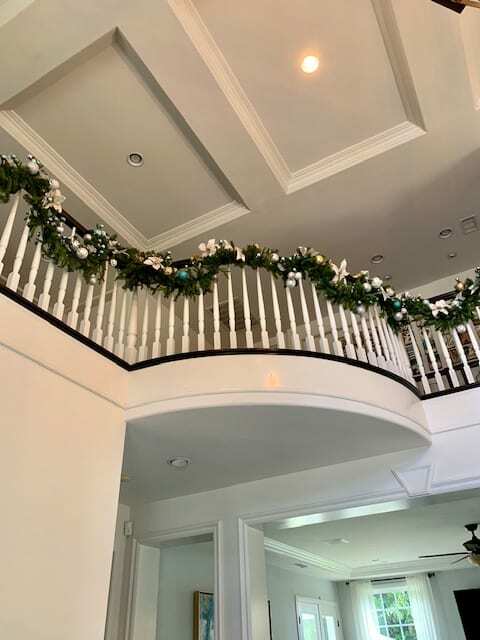 I will say, adding some decorations for the holidays has been the most “finished” this room has felt as it truly has more life this time of year. 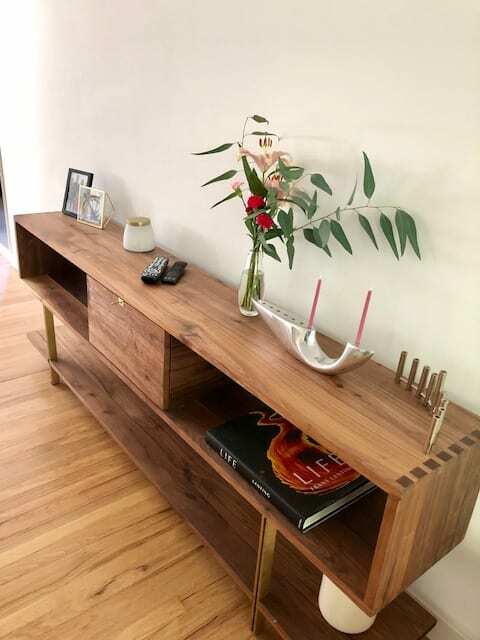 I am absolutely obsessed with this new piece of furniture we have added to our home, and what perfect timing as it is the perfect spot to house our menorah as we gather each night to light the candles. Black and white and styled just right! I mixed in a few accessories to give this area some bohemian flair. I plan to get a large fiddle leaf fig for this planter, but for now it’s a fun spot for extra blankets and presents. 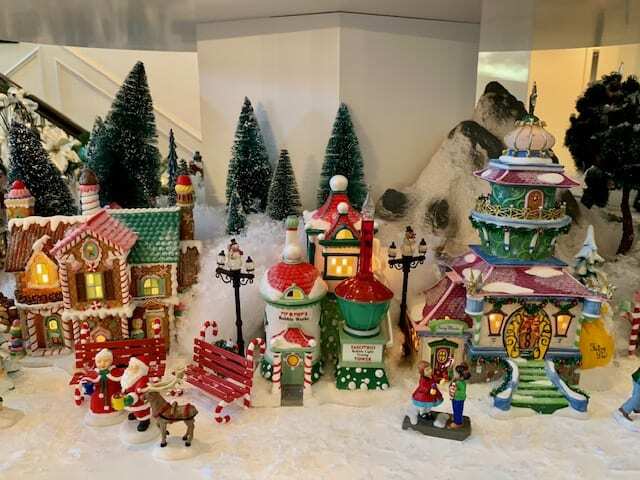 The holidays are officially here, and I am sure like me you have been anxiously waiting all year to bring some holiday cheer to your home through decorations, special meals, and gifts for your loved ones. 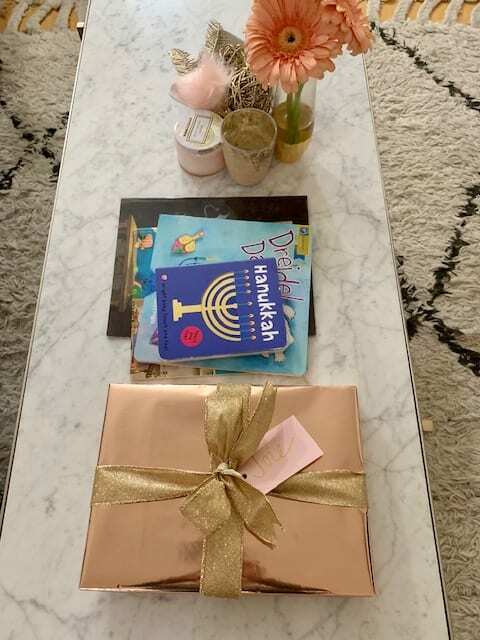 I love decorating for the holidays and have done a little in my own home (which I will show off on the blog next week), but my newest client has helped me take this love to the next level (and I might mention made all my #jewishgirldreams come true!). I especially appreciate when someone brings a new challenge our way and when their attention to detail and personal style is on point. All of these things made this project so much fun. Check it out! This wreath is 6 feet in diameter and covered in lights (Three hundred, to be exact!). I’m pretty proud of the fact that I lit and decorated it all myself. 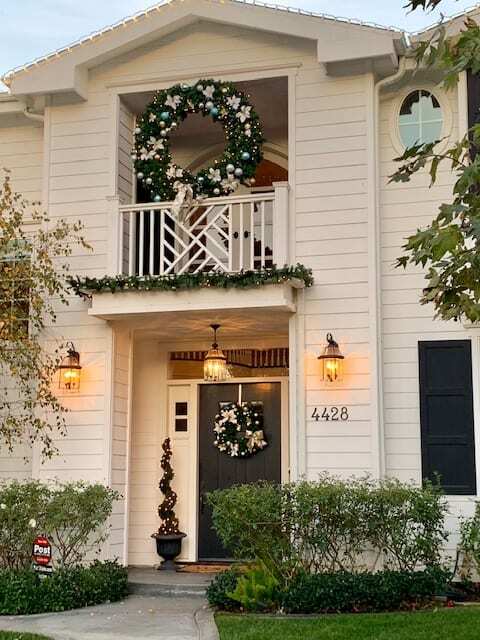 A matching wreath welcomes in guests all holiday season long. 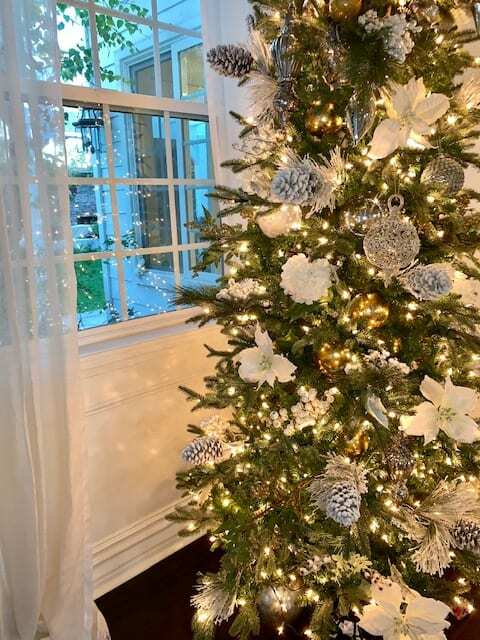 … and more, is fully dressed in sparkle and flair (gorgeous gold and silver bows, white poinsettias, and lots and lots of bulbs). 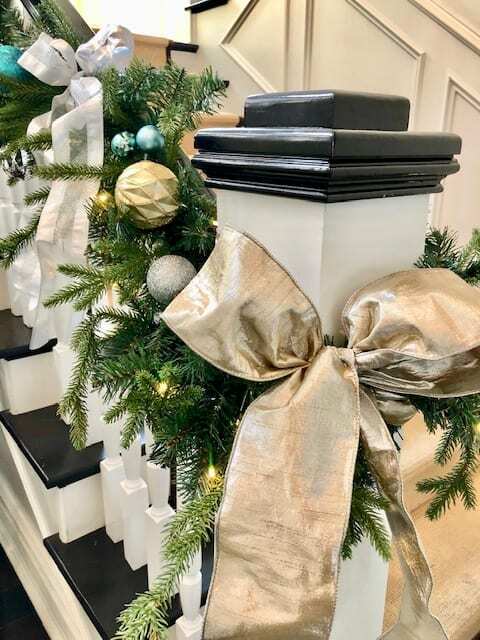 I love the color scheme we selected for this year’s holiday decor because it speaks to what the Side by Side Design mission is exactly … Decorating for holidays and events is a dressed up version of your existing space. 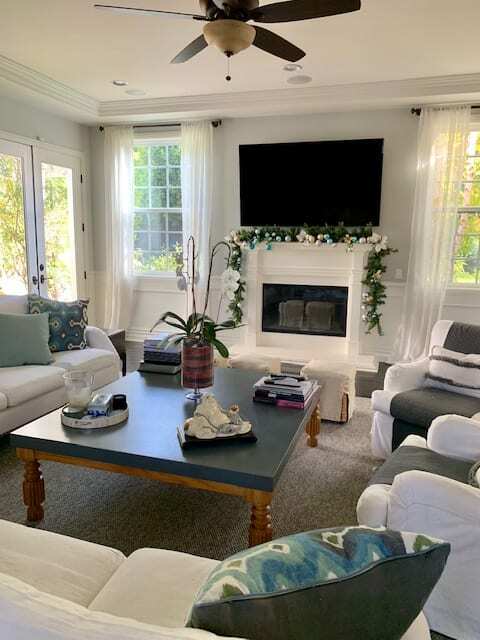 We chose to include pops of turquoise to coordinate with the pops that already exist in this client’s home and give the overall look a festive and elegant feel. 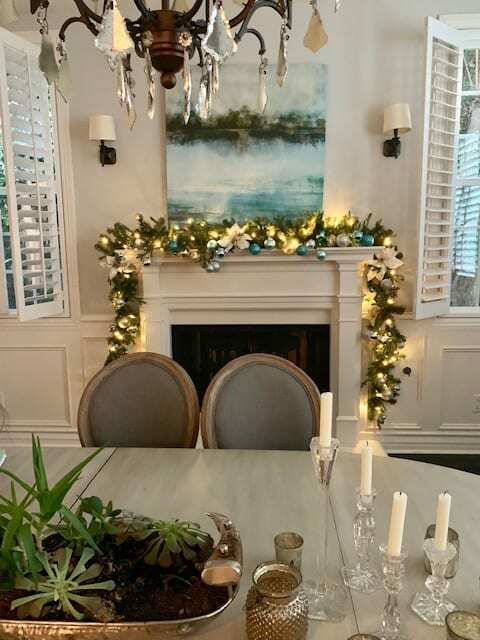 Don’t you just love how the mantle in their dining room turned out? 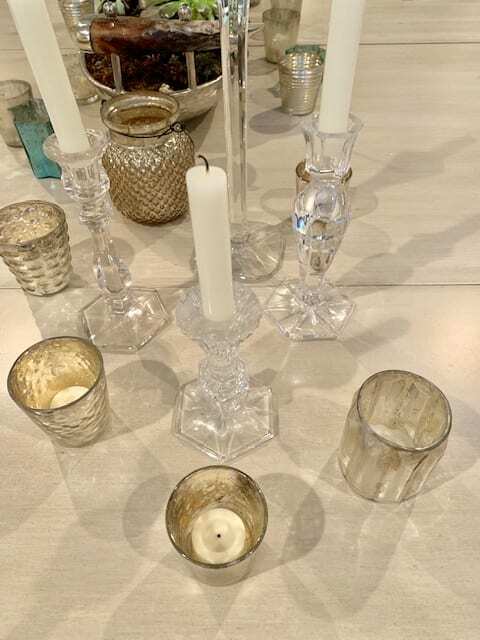 You also can’t go wrong with incorporating tons of mercury glass candle holders into the mix this holiday season! 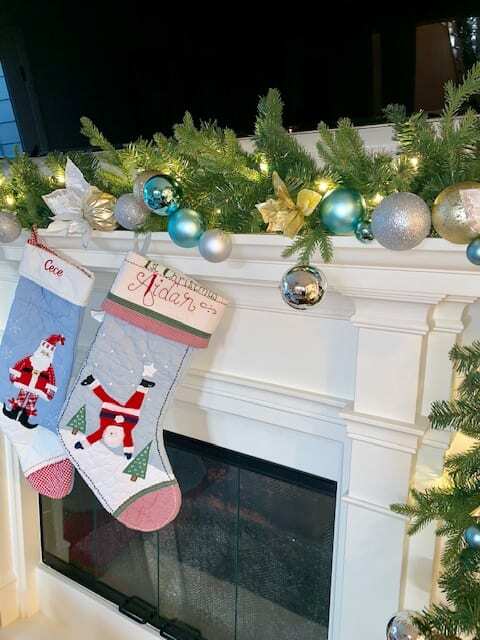 Matching garland was added to their living room fireplace as well. 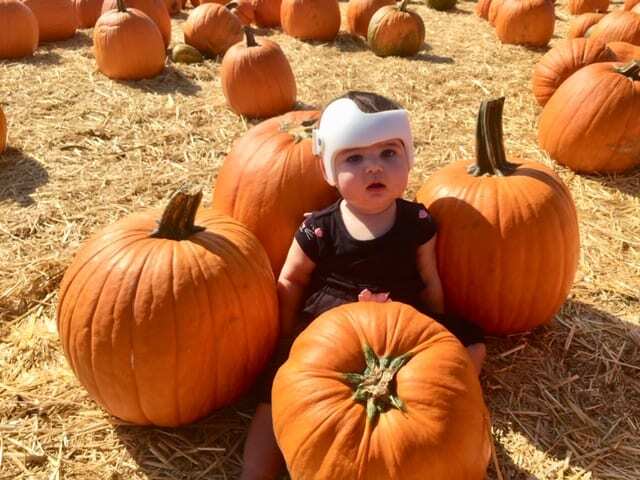 I love how much this family cherishes traditions this time of year. They shared with me that these stockings were made for each of their kids when they were small. Love all the personal touches! I will not take credit for this tree at all! 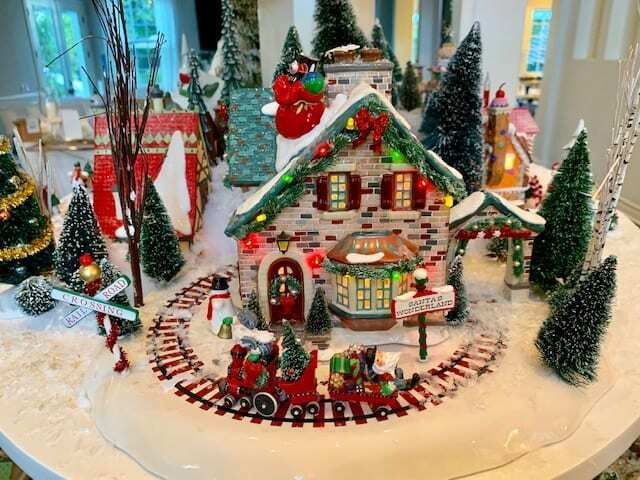 It is stunning and created with love by the family themselves. I mentioned before that this project presented a new challenge, right? 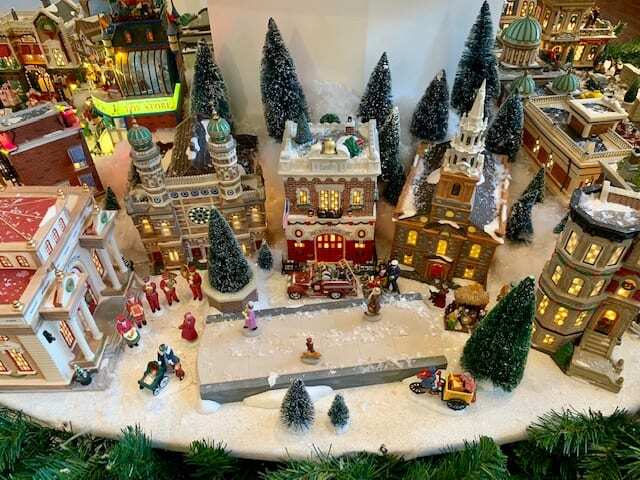 When we first met, our client shared with us that they collect pieces to a very special Christmas village. This has been a tradition in their family for a very long time passed down from their grandmother. 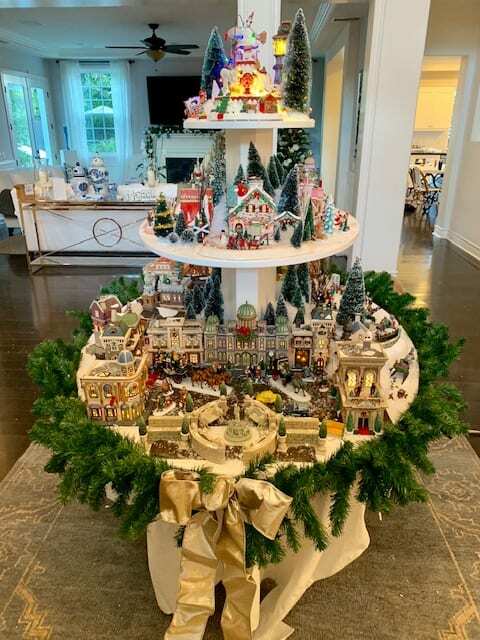 Every year they display this in their home, but it has always been a dream of theirs to have a place to display it in the right way where every piece can be seen (and every cord plugged in as the majority of the pieces light up and some even move). We brought in our dad to build a custom piece as we knew that he would get their vision completely. After consulting with his electrician, he came up with a plan for the three tiered table you see here. Although all of their decorations were beautiful this year, this is the show stopper! 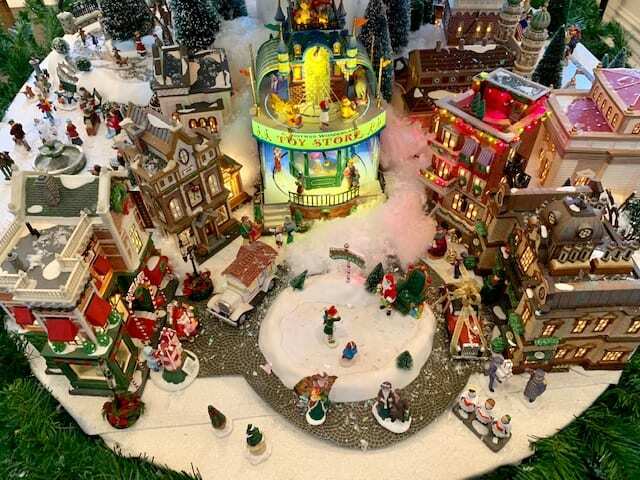 The bottom level of their Christmas village is the “city”. We assisted this family in creating building lined roads for the horse drawn carriages and cars to sit on. Each piece was carefully thought through and placed from the people, to the trees, to the wreath on top of this center building. 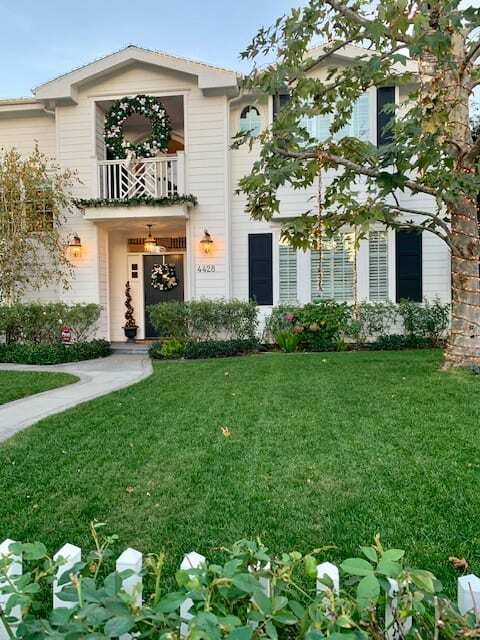 Other areas of the city include the church, ice skating rink, toy store, and our favorite … the dog park! 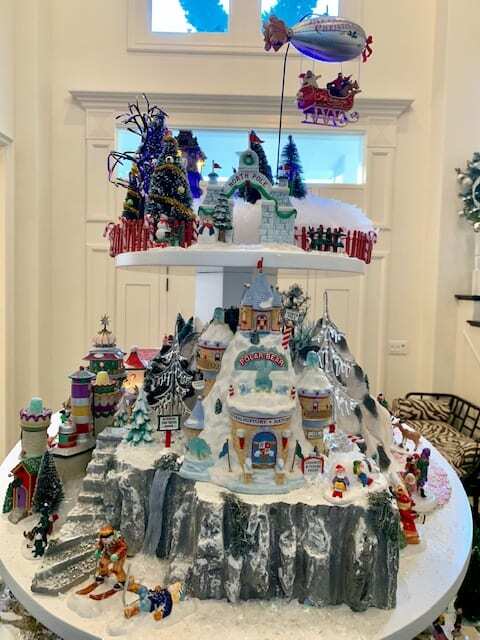 The second and third tiers are “the North Pole”. Santa and Mrs. Claus live at the top! The houses and shops are a bit more whimsical in this area and you might even see some elves running around. 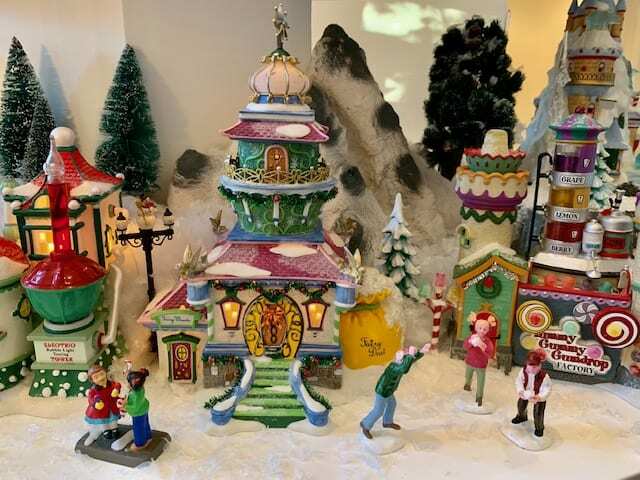 Some of our favorite features include the trees and houses that are decorated for the holidays, the peppermint candy lane, the train on its track, and the reindeer (of course!). 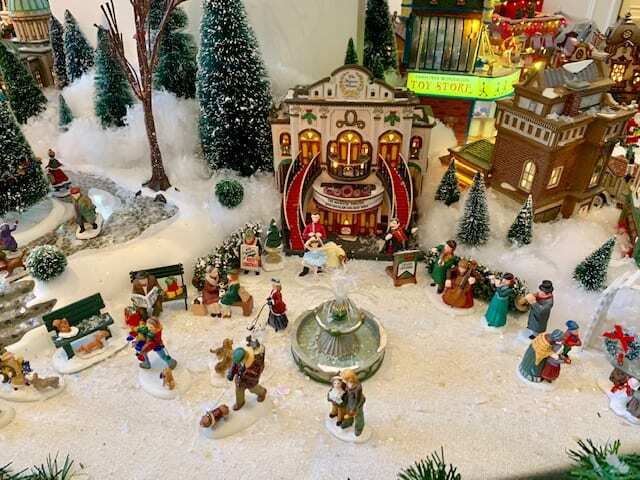 I know this family will enjoy their decor and Christmas village display all month long. Their excitement for the holidays has rubbed off on us for sure, and I personally am just happy to have been a part of it! This truly is the most wonderful time of the year. Happy Holidays from Side by Side Design!